2. APS. Altitude preselect panel. 4. ADF1 panel, red needle. 1. STABILIZER TRIM STOP SWITCH. In STOP position brake is applied to stop a stabilizer runaway condition. 2. LEFT PNUMATIC CROSSFEED LEVER. Position UP = OPEN (picture). Permits crossfeeding of air between the two pneumatic systems. Also to air condition and/or ice protection system as well as from the APU air system. 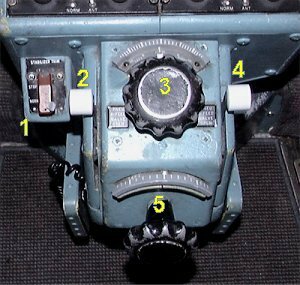 Actuates the rudder load feel unit. During power operation the complete rudder surface is displaced. 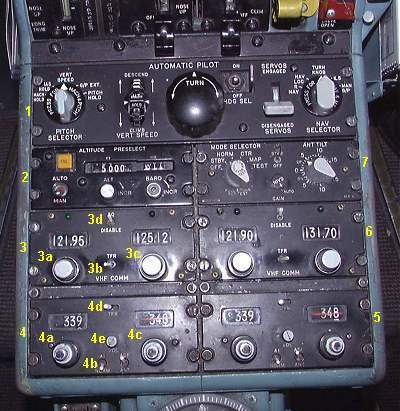 During manual operation the rudder control tab is displaced. 4. RIGHT PNUMATIC CROSSFEED LEVER. Position UP = OPEN (picture). Actuates the aileron trim tabs.